After his presentation to students, Marshall Singer, center, answered students' questions in the corridor. Singer's startup company provides security communications at high schools in seven states. 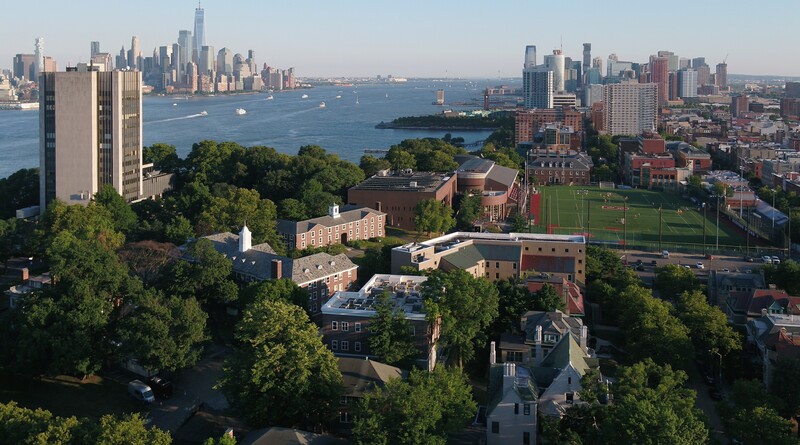 Aspiring entrepreneurs at Stevens Institute of Technology often pursue their idea for a business during Senior Design, an undergraduate capstone experience where lessons in marketing, finance, economics and management are applied in real-world settings. In a recent visit to a Senior Design class at the School of Business, Marshall Singer told students that chasing your dream as part of a class project is a great place to start. But he didn’t recommend every aspiring entrepreneur go all in the moment they graduate, as going full time right away can make the nascent company less flexible and compromise an entrepreneur’s ability to pivot. Calling that the defining moment of the company, Singer explained that the company pivoted its focus from a discipline management system to a security-focused communication service designed to help teachers and school administrators track students in event of an emergency, like a fire or shooting. Fire drills in high school, Singer said, “were sweet for the students — you get out of class for half an hour. But half an hour is serious if the building is on fire and you don’t know where some of your students are.” As a result of its switch away from the overcrowded anti-bullying market, the Brooklyn, N.Y.-based company has grown to 30 client schools in seven states. Of the more than two dozen Senior Design projects that will be showcased at the May 2 Innovation Expo at Stevens, 11 are entrepreneurship concepts — everything from an app to provide technology tools to therapists, to a new cryptocurrency exchange, to a crowdsourced weather app. Even consulting projects could be thought of as entrepreneurial, Singer said. “Whether you’re selling a customer on your solution or your client on your recommendations, if you can’t say how you’re solving the problem in seven seconds, you probably need to stop and rethink what you’re proposing,” he said. Singer then called on various project teams, asking them to explain — or refine — the who, what and why of their project in a few seconds. As part of the Senior Design experience in the School of Business, students get close access to faculty like Dr. Ann Murphy, associate dean of the undergraduate division, and Dr. Jim Biagi, an associate teaching professor. But having an entrepreneur provide live coaching made classroom concepts come to life, Dr. Murphy said. Students asked Singer plenty of questions — from his experience in an accelerator, to his marketing strategies, to the sensitivities of collecting data about children in school — in an extended Q&A that spilled into the corridor after class. It was clear Singer, who graduated from American University in 2016, enjoyed the experience, also.